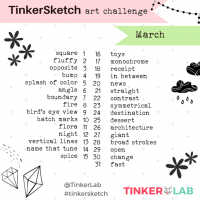 TinkerSketch is a daily sketchbook practice that invites you to experiment and play with ideas and materials in a low-stress, fun, and mind-stretching way.Print out the prompts and tape them into your child’s sketchbook, or your own. Interpret the prompts as a family. Invite your class to have a drawing warm-up when the walk in (this is a great way to focus energy). Don’t worry about the outcomes and allow yourself to play! Our goal is to have a great time with no judgement. 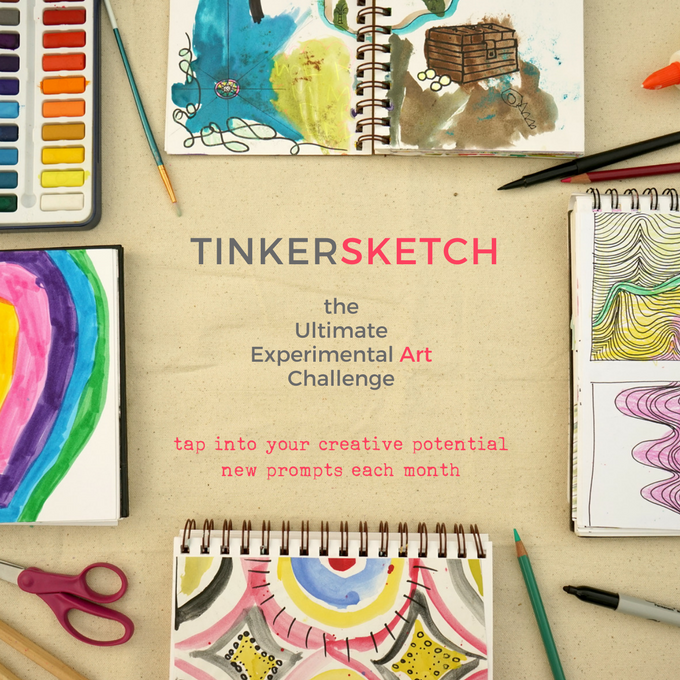 Reshare on your Instagram wall or post to Facebook with the #tinkersketch hashtag. 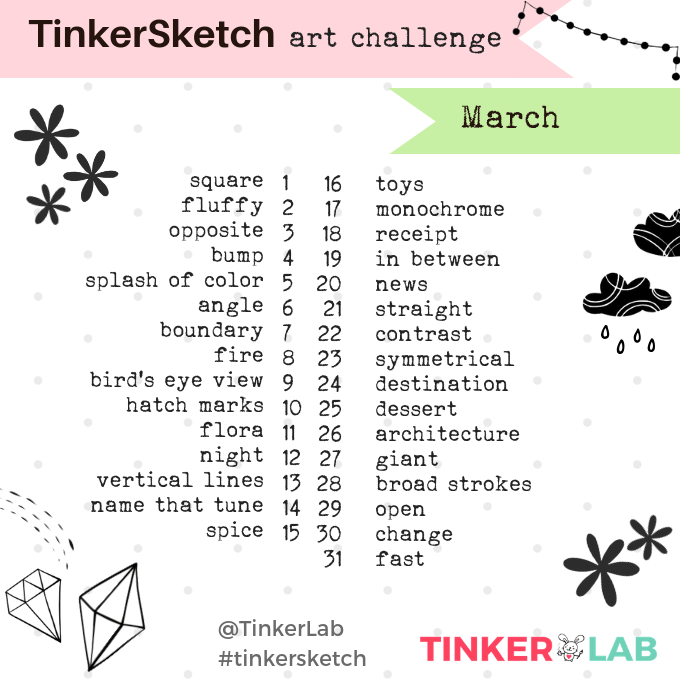 Art challenges are more fun with friends, so be sure to ask a buddy to join you. 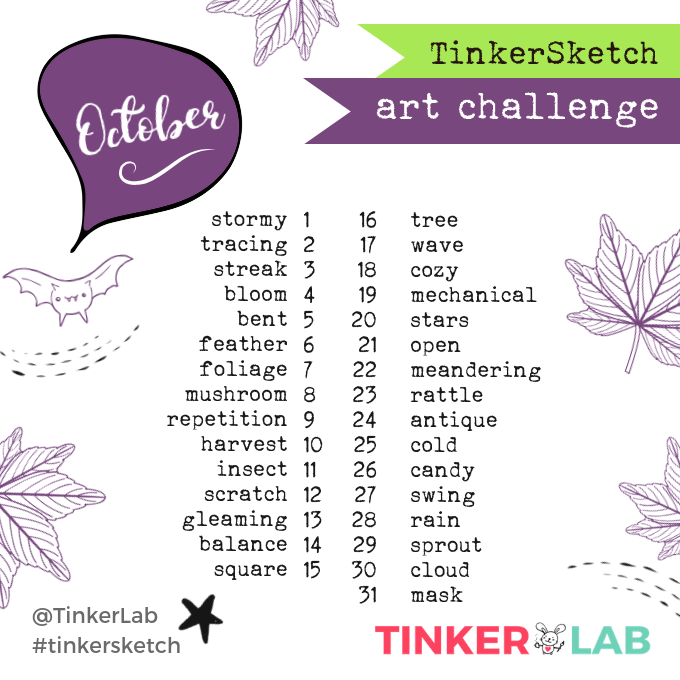 You guys…I am so excited to say that the TinkerSketch challenge is back! 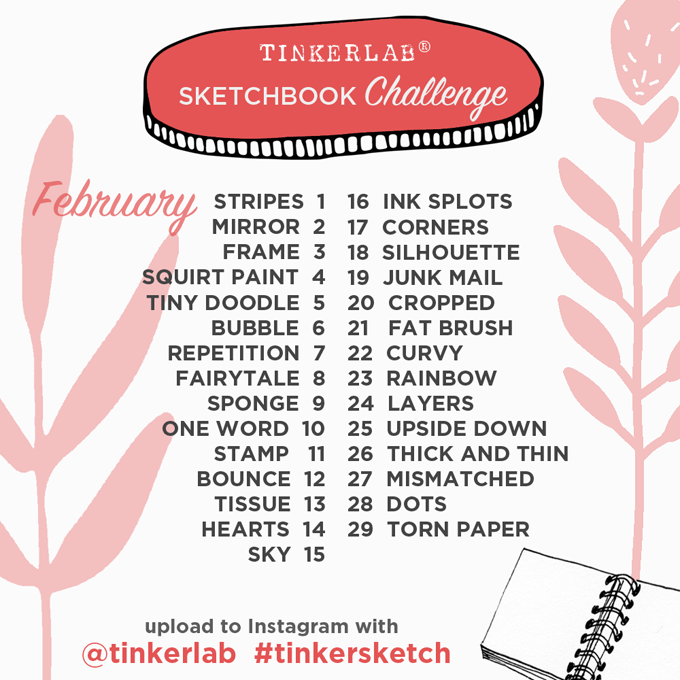 Brace yourself for another round of fun and easy-to-achieve sketchbook challenges for the month of February. Will you join me? 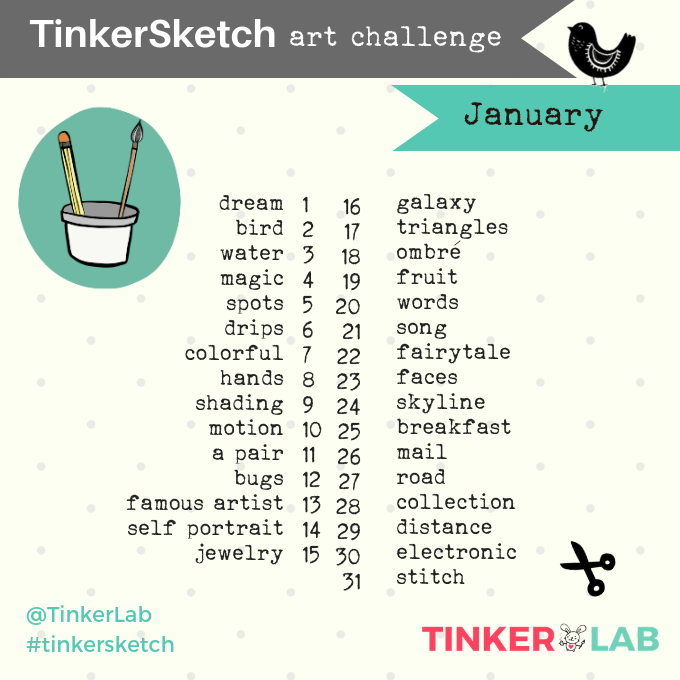 First of all, this challenge takes place on Instagram, so you’ll want to start by following TinkerLab over there. What’s the TinkerSketch Sketchbook Challenge? Who is this Sketchbook Challenge for? If you’d like to jump-start your creativity with a daily mark-making routine or establish a more regular art journalling practice, this challenge is for you. The stakes are low and it’s super easy to do, even if you have no experience or low confidence with making. And if you’re busy, the time commitment is minimal. 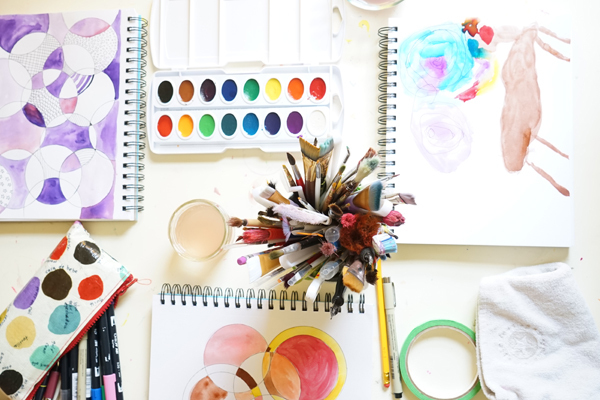 You might have had some time to nurture your creative soul at some point in your not-too-distant past, but with kids, work, chores, responsibilities, name your excuse, you don’t have a lot of time for the creative YOU. 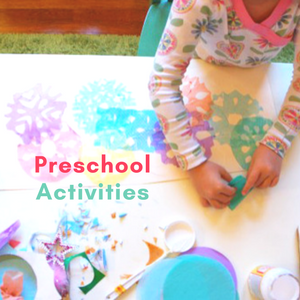 The goal of this challenge is to make time (even if it’s just a tiny bit) to celebrate your creative self through hands-on making. 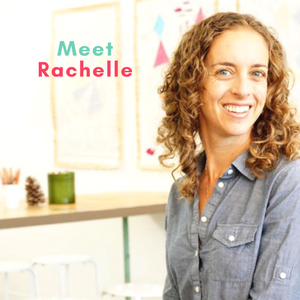 While you can spend as much time at this as you like, just set aside five-ten minutes each day aside for making, creating, and experimenting and you’re in business. I’m REALLY not an artist. Are you sure this is for me? This is for everyone, truly, and you are not expected to make a masterpiece with this practice. Rather, the point is to unleash your creative energy. Your creations don’t have to be works of amazing art, and in fact they probably shouldn’t be all that spectacular, especially if you’re pushing yourself to try something new, experiment, and be bold. Be confident with whatever you create, knowing that you’re on a journey to feed your creativity. 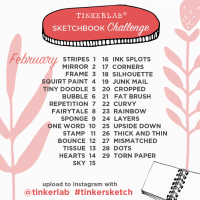 What Sketchbook and Tools will I Need? My best advice is to visit an art store and test out sketchbooks to see which one feels right to you. That said, here are a few tips. Spiral or book-bound. Do you think you’d enjoy a spiral-bound book or traditional binding more? I recommend spiral binding because the pages lie flat easily. Some people like traditional binding more because they can design/paint/draw a double-page spread without having a gap between the pages. My favorite Sketchbooks. I have two favorites in this category for working with both wet and dry media. Both of these books can handle paint. Strathmore Visual Journal is made of heavy duty paper (90 pound weight), perfect for mixed media, and comes in a few sizes. For easy, on-th-go journaling, I like the 5.5″ x 8″ journal at $6.89. 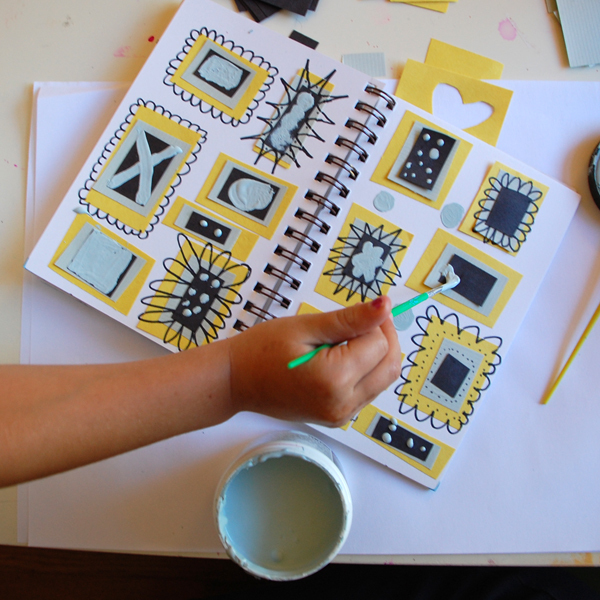 I also like the Canson Mix Media journal that’s 7″ x 10″ for $8.19. A friend just gave me a Stillman & Birn Zeta series and I love it. The paper is 180 lb. Get yourself a few pens that you love to use, and be sure to have at least one waterproof, archival pen in the mix so that you can paint over your pen lines without worrying about your drawing bleeding with water. 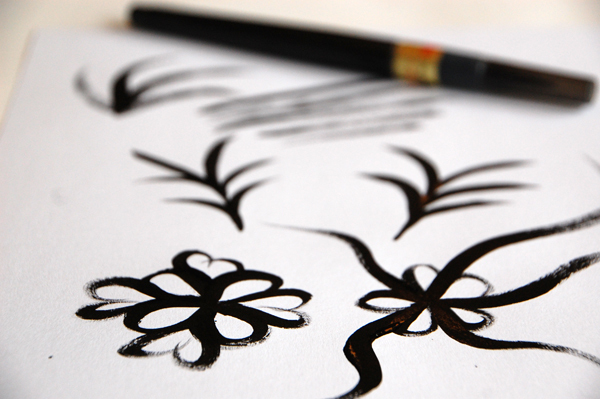 Micron Pens are a designer favorite (and mine, too! ), and they come in tons of sizes and colors. Watercolor Paint. I highly recommend the Opaque 24 Color Watercolor Set from Pelikan ($20.15). For a bit more money, Pelikan also makes a Transparent Set of Watercolor Paint ($34.03). If you don’t want to go crazy (I know, I only *just* bought the Pelikan sets myself) a standard kids’ watercolor set will do just fine. 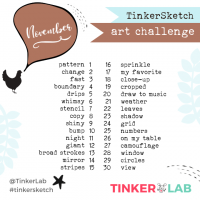 For each day of the challenge we’ll share our own daily entry on Instagram (don’t forget to follow me! 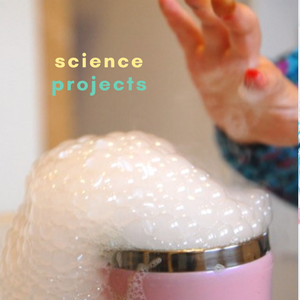 ), along with a few extra ideas in case you need a little bit of inspiration. I encourage everyone who joins the challenge to leave supportive comments on other participants’ images. Since it can be hard to put ourselves out there, it’s always nice to receive a friendly pat on the back when pushed outside our comfort zone. No sharing required! Some of us are motivated by sharing, since having others look at our work holds us accountable and we enjoy the feedback and community of sharing. However, you can follow the daily challenge, even peek in on other people’s work on Instagram, and never share a thing. Can I do this with my Kids? Print out or bookmark the list you see at the top of this page or below. 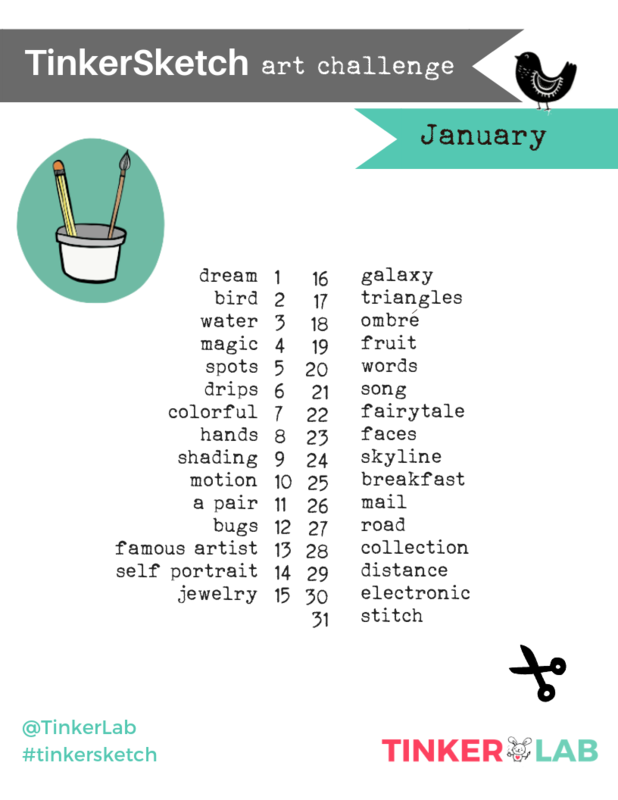 Each day has a new prompt that will inspire you to make something. January is a wonderful time for fresh starts. 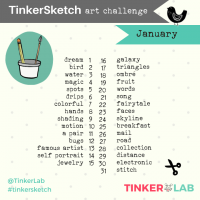 If you’ve ever wanted to bring more art into your life, you’re officially invited to join us for the January Art Challenge, filled with all sorts of prompts to get your creative ideas flowing. 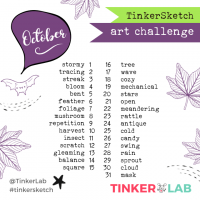 See last month’s challenge here. You’re officially invited to join us for the November Art Challenge, filled with all sorts of prompts to get your creative ideas flowing. 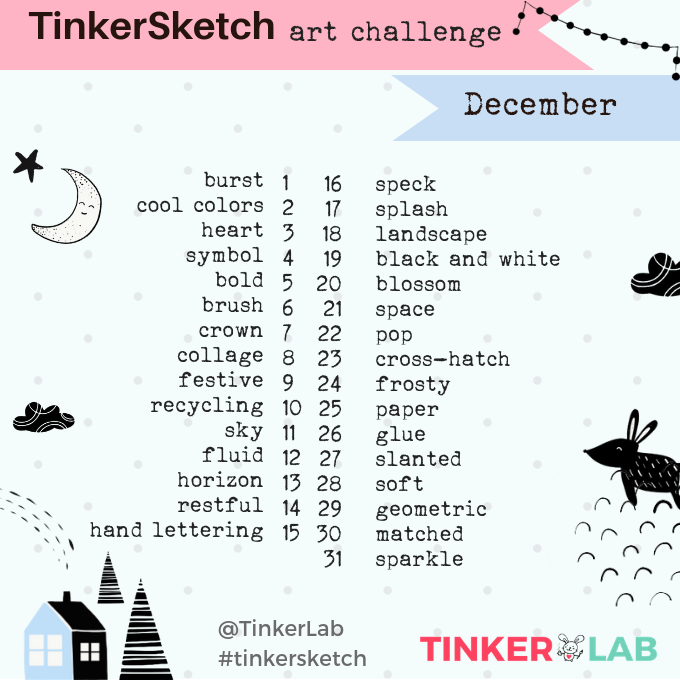 This month’s selection is filled with maker words that can help you dream up new ways to interpret art materials and processes. The main goal is to have fun. Don’t worry about the outcomes and let yourself play!